The most frustrating laptop issue is no doubt the “no boot / black screen but powers on” can be caused by for a few different reasons. But without an error code, it’s sometimes hard to tell what the issue can be. It’s not difficult to check the basic things; swapping memory with known working models, cleaning memory ports, Ac Adapter, verifying the LCD is ok, (the list goes on and on) etc. If it works AWESOME, YOURE A CERTIFIED COMPUTER TECH! If not, read on. In some instances, especially with todays $300 disposable laptops and their “get what you pay for” quality, a faulty motherboard / solder connections to video and/or CPU could most likely be the issue. Michele, a local Willimantic customer in Connecticut sought us out for her Inspiron M5030 throwing 7 beeps upon bootup, indicating it was a faulty CPU or CPU connection. It’s very important to narrow down the issue before jumping to the next step, luckily in this case, Dell was kind enough to list the error codes in their service manual. Without the error codes, its possible to narrow down the problem, but it just takes longer. After disassembling the unit, disconnecting and reattaching the CPU, it still wouldn’t boot with the same error codes. The next few steps is the fun part. Proceed with caution, we’re not responsible if you blow up your laptop, your house, or anything else that you might try to sue me for. If you don’t feel comfortable working on your laptop, we offer mail in service or if local to CT, PC or Laptop drop off service. If we don’t fix it, you don’t get charged. Most of these motherboard, CPU/GPU repair jobs are done for around $60. Step 3. *IMPORTANT* Take off heatsink, clean and remove any thermal paste, and any plastic or connections / boards surrounding the CPU, GPU or Chipset. Step 4. 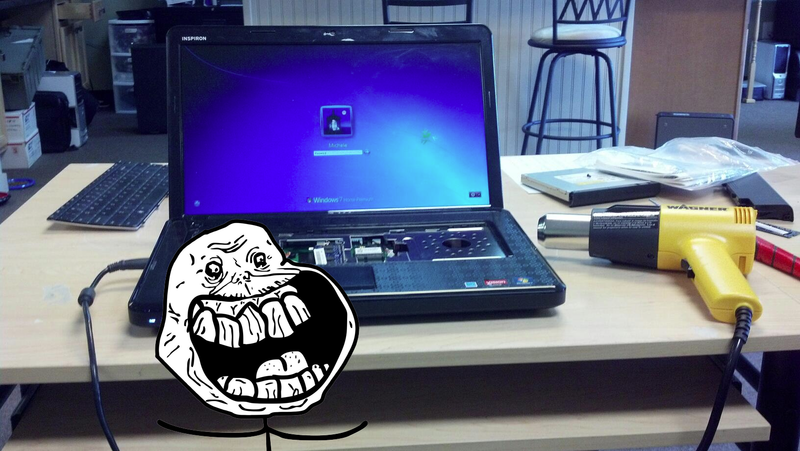 Most laptops have 3 chips dedicated on board close together, locate them. Step 5. Apply Heat gun for 2-3 minutes on the area in question to reflow the solder connections. Step 6. Reapply thermal paste (we use Arctic Silver for the best results of thermal conductivity), reattach heatsink and anything else you disconnected & boot machine to test your work. Step 7. If the same problems exist, you may not have left the heat gun on long enough, left it on for too long, orrrrr the board is dead. Repeat the same steps again for round 2. 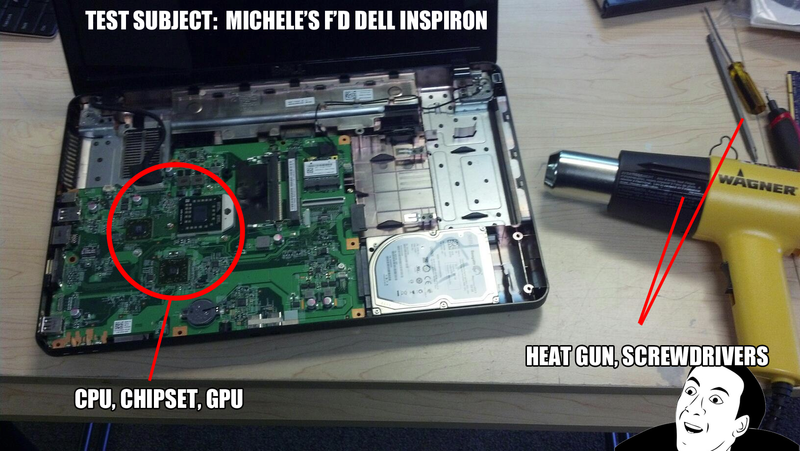 We’ve done this heatgun tactic to a few laptops with great success – but only to Nvidia GPUs. Is this 7 beep code on the M5030 a GPU or CPU issue? it appears to be a socket issue with the CPU/Board on 90% of the one’s i’ve seen. Just want to be clear, should I be removing the cpu before applying the heatgun? Yes? yes. the issue is the connections in the actual CPU Socket. Wait what do you mean remove the cpu? The thing is like attached to the whole motherboard. So like would a lighter or a blow dryer also work if i leave it on for longer?